(Host) Senator Patrick Leahy, who was the target of an anthrax attack seven years ago, says he trusts that federal authorities have identified the person responsible. But Leahy, who chairs the Senate Judiciary Committee, says he wants to know the motivation behind the attacks, and if others were involved. 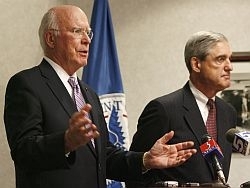 Leahy and FBI Director Robert Mueller (mull-er) were in Vermont (today/on Thursday) to visit law enforcement operations focused on terrorism and computer crime. (Host) Five people died in the anthrax attacks, and 17 others got sick. Leahy’s Washington, D.C., office got one of the letters in the fall of 2001. And Mueller – who has met with victims in the case – used a previously scheduled trip to Vermont to brief Leahy on the evidence. The FBI has identified government scientist Bruce Ivins as the suspect. Ivins killed himself last week. And Mueller said the FBI is sure that Ivins was the killer. (Dillon) The government has released some of the circumstantial evidence it’s compiled over the last seven years, including Ivins’ emails, and logs that showed he spent late nights working alone at the Army’s Fort Detrick lab in Maryland. Mueller said the most compelling evidence came from the DNA fingerprint of the anthrax used in the attack. (Dillon) Leahy said he’s been touch with Mueller repeatedly over the years to check the progress of the investigation. He said he wants to know the motive behind the attacks. (Dillon) The government’s investigation apparently focused on the wrong person for years. Then-attorney general John Ashcroft named another Army scientist, Steve Hatfil, as a person of interest in the case. But in June, the government paid Hatfil $5.8 million to settle his claim that he had been wrongly accused. Mueller was unapologetic about the focus on Hatfil. (Dillon) Leahy said he’ll ask the Senate Judiciary Committee to look into the government. investigation. (Dillon) Director Mueller was in Vermont to visit an anti-terrorism center in Williston. He also got a tour of a Burlington Police Department task force that works to prevent computer crimes against children.